I was in Toronto for the past several days attending the annual monster conference of the National Association for College Admission Counselors. I was a presenter with a couple of my friends – Paula Bishop and Cyndy McDonald – at a pre-conference, which I hope was beneficial for those who attended. I can’t recall ever sharing the microphone with anybody during a college presentation so that was a little tough. I wanted to keep talking. I’ve never attended a conference on crutches (I broke three bones in my foot five weeks earler), which certainly gave my arms a workout. The distance between the entrance to the convention center and the section of the facility where NACAC’s confab was located was around a third of a mile. Traveling with crutches, however, does get you through customs quickly. I spent most of the conference talking with college admission folks, high school counselors, independent college counselors and higher-education vendors. I thought I’d share a few of the things that I picked up on during the conference. I’m going to be devoting an entire blog post to this later in the week, but one website that I am excited about is College Abacus, which allows you to type in your financial information just once and then access any college net price calculators. I wrote about this website last year, which as it turned out was premature, but it’s now out of beta and officially up and running as of today. At the conference, I bumped into Abigail Seldin, who is the founder of the site which can rightly be called the Kayak of college pricing. Or you could call it the Zillow or Expedia of college pricing. Actually, I think it would be more accurate to call it the Kelly Blue Book of college pricing because using a school’s net price calculator won’t get you the exact price, but with good calculators it should get you close. More later. 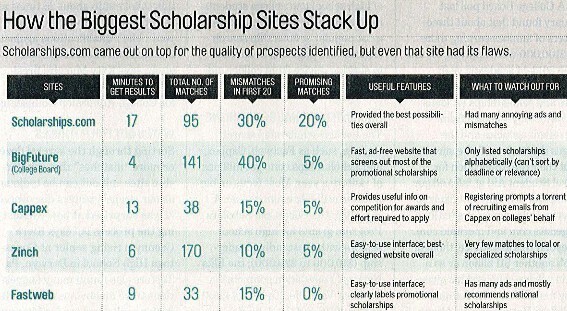 I’ve always warned families that private scholarships represent the smallest source of college funding, but what I suspected, but didn’t know for sure, is just how lousy college scholarship search engines are. At the conference, Kim Clark, another friend of mine who is an ace journalist at Money magazine and a former reporter at U.S. News, gave me the October issue of Money that contains a story she wrote that illustrates how incredibly ineffective scholarship search engines are. The research suggested that Fastweb, which is very popular, produced the worst results, but none of the search engines were good. I wandered over the the FastWeb booth at the conference and asked the reps there about Money’s results. They shrugged and said lots of users love their site. That was an underwhelming response. You should buy the magazine to read about the scholarship research, but one take away is that it’s almost always going to be more productive looking for local scholarships which are usually not in these massive databases. Somebody at Staunton (Il.) High School scanned the Money story and posted it on their website and I’m sharing Kim’s chart that is admittedly hard to read. 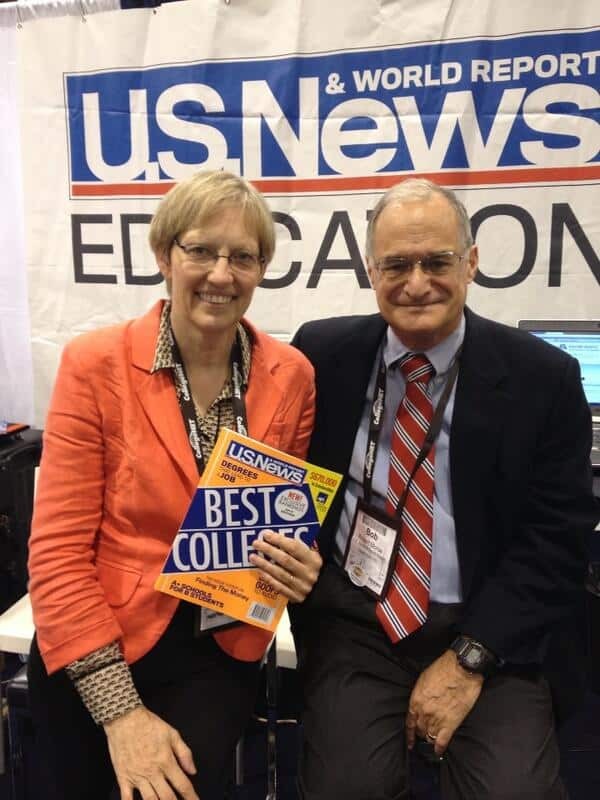 I bumped into Bob Morse, U.S. News’ college rankings, in the convention exhibit hall eating lunch with my friend Kim and Diane Harris, another Money magazine journalist, who was amazed at the crush of higher-ed vendors at this conference. It really is overwhelming for first timers. 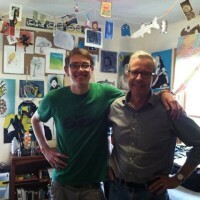 Despite being used as a punching bag by me and many others, Bob is always amazingly good natured about it. Kim and I noted that we’ve never seen Bob get angry about the tremendous flak that he receives. One of the highlights of the annual conference is the gigantic college fair that takes place on Friday afternoon for participants. It’s an awesome resource to talk to admission reps, often including the top dogs, at the event. Every year at this private college fair, I stop in to say hello to the folks at the Juniata College and Beloit College booths. 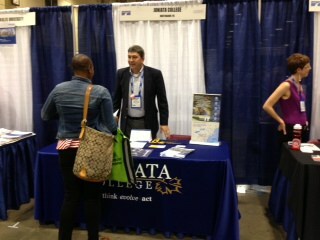 Brett Basom at the Juniata booth wanted to know what my daughter Caitlin (Juniata alum 2011) was up to. Caitlin has a great job as the marketing manager of a toy company in San Diego and she continues to run her little side businesses that have included creating and selling picture frames, her own prints and iPhone cases. She also moonlights as a social media consultant and she jogs at the beach during her lunch hour most days. Next I talked with Nancy Benedict, who is the vice president of enrollment at Beloit College. She wanted to know how Ben, a mathematics major and studio art minor, was doing and what he planned to do when he graduated in the spring. 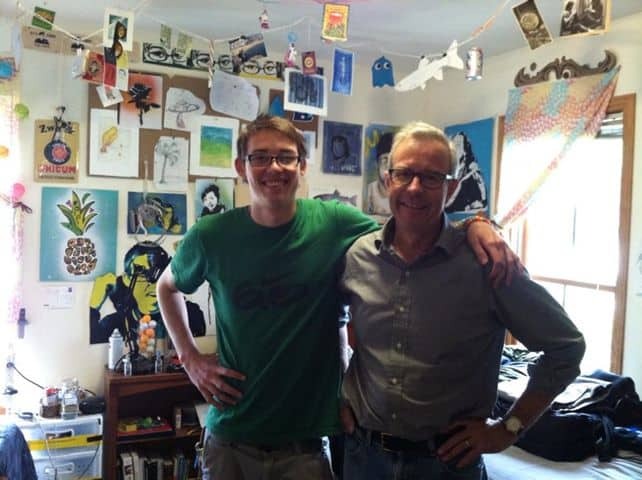 Ben and I are exploring teacher residency programs at urban school districts and charter schools and other teaching/master’s degree opportunities for Ben after graduation because he wants to become a high school math teacher. He hopes to avoid teacher credential/master’s degree programs offered by traditional schools of education because they are heavy on theory that don’t prepare a rookie teacher for the classroom. If anybody has any tips for us on good programs, please get in touch! Finally, I’m going to be speaking at the Warwick Valley High School in Warwick, NY, starting at 7 p.m. tonight (Sept. 23). If you are in the area, I’d love to see you! In general without a teacher credential there is no way to teach in public schools. At least that is the case in California. And I agree a lot of this teacher credential program is more on the theory side. There is a study on teach prep programs. I’m not sure your son will qualify for this just yet since he needs to be teaching math for at least one year but perhaps something to file away? It is the Master of Mathematics Teaching degree from the University of Waterloo in Canada. It’s an online, part time degree program that is NOT heavy on pedagogical theory. Thanks John. I appreciate the suggestion! Do you know if your engagement is open to non-Warwick Valley school district students and their parents? Sorry I only saw your email now after I got back from my presentation at Warwick High. Yes, the event was open to other schools.